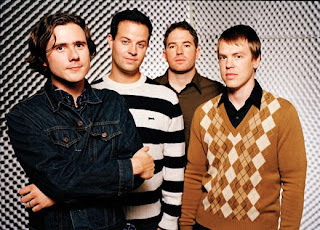 Kingdom of God Media: Jimmy Eat World -- "Pain"
--Numb yourself to present circumstances whenever and however this might be convenient for you. --Take care of yourself first. --Alter your mind by any available means; this is an acceptable alternative to improving your actual character. --You're really having a good time when you're so sloshed that you're barely conscious. --Like yourself first; everything else is second. Lauryn Hill said to her audience at her MTV Unplugged concert, "Fantasy is what people want, but reality is what they need." When I hear this, at first I feel indignant that anyone would threaten my right to embrace whatever fantasy I want for myself. I wouldn't admit out loud that I love fantasy, of course... I would object with some kind of self-serving statement, such as "Who are you to say what reality is?" It is difficult to acknowledge reality; that's why we would rather embrace distraction or anything that gives us an escape. Dealing with reality is necessary for us to grow up, for one thing. Even better, the more we obey Jesus Christ, the more He will chip away at the foundations of deception upon which we have built our lives. The more we tear out and destroy the lies that have crept into our minds and hearts, the freer we will be to know and fellowship with God. This kind of freedom has to be grown into through years of trial and hardship, but this is infinitely better than willful, childish self-deception.